Sometimes articles take an age to come together and at other times, they just seem to appear fully formed. I am so glad to say that this, my first article after our move is one of the latter. Now we have just moved (which was the reason for my two-week hiatus) and we are still getting things together. However, I am pleased to see herself has our priorities right with art by Simon Bisley, Colin MacNeil, Frank Hogshaw and Ian Kennedy already adorning our walls. There is still plenty to be added such as the Ian Gibson bookworm, a Janine Van Moosel page from City of Lost Souls (do you like the plug James?) and many more that I could mention, but I am going to stick with these so far. One of the pictures that is up on the walls is the Ian Kennedy print that was commissioned by Peter Richardson for the cover of issue 4 of his excellent Achtung! Commando fanzine. Now this Ian Kennedy picture commissioned by Peter was a gorgeous Battle of Britain piece and Peter could not bring himself to sully it with logo and graphics so he turned it into a print. I was fortunate enough to purchase Artist’s Proof 4 of 5. 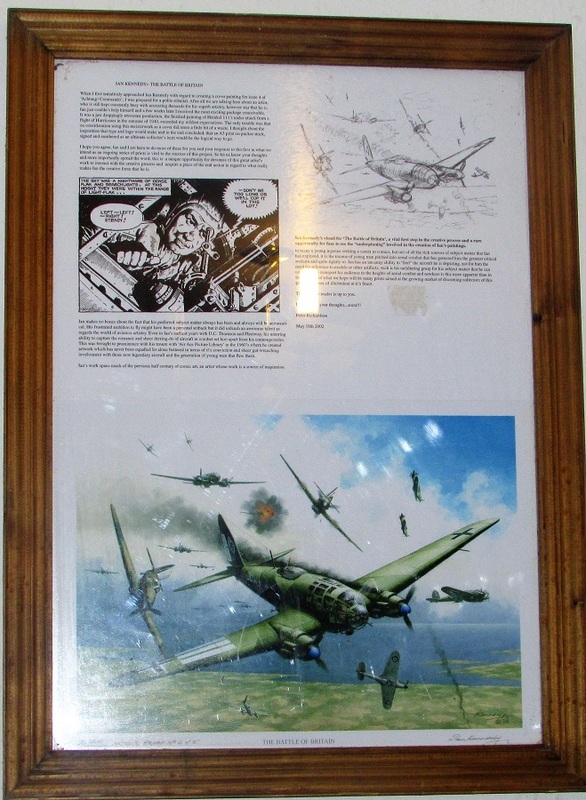 As I was working at RAF Lyneham at the time, I was also able to get a bespoke picture frame made for it at the Station Workshops that not only encompassed the print but also the A3 description that Peter sent out with it. And that description page has left me intrigued for many years, as it featured a panel from a comic that I had yet to find. I knew that it could not be a Commando as I knew that Ian had only done the internal art for 4 Commandos when I bought the print and I knew that it did not belong to any of those. (It was 5, but it did not belong to the 5th one either). The only other picture library that I knew Ian had done work for was issue 325 Air Ace Picture Library titled The Spider’s Web as I had picked that up at a car boot in North London in the 1990s. 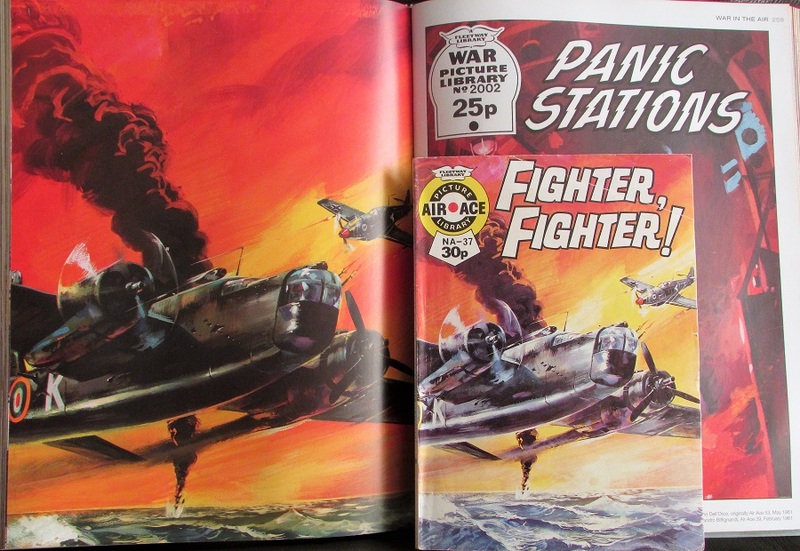 The next one that I had discovered, that Ian had done, was one that I purchased earlier this year which was issue 326 Air Ace Picture Library War In The Air which had the cover and internal art done by Ian. I do know that Ian has done loads more than his work on the Boys’ Picture Libraries but the more I can to praise this small corner of comic fandom, the happier I will be to spread the love. However, let’s fast forward to the 1st December 2016 when a friend had been good enough to go to the next town over from him and cherry pick one of the charity shops on my behalf and he sent me over a house-warming gift that made me smile. Six Fleetway Air Ace Picture Libraries and two Famepress Combat Picture Libraries is a great present for me on any day. And to get Fleetway Picture Libraries with non-rusty staples from the 1960s is just amazing. Here I am going to digress a little. For some reason, almost every single 1960s and 1970s Fleetway Picture Library was sold with a staple as part of its’ binding. It was not the worst idea, but the problem was that these staples were generally of a poor standard and because of their low calibre, they would begin to rust rather quickly. So, for anyone to pick up any Fleetway Picture Library from the 1960s and for it not to have a rusty staple either indicates that the person that originally owned these got lucky (In the dampest country in the world? I don’t think so!) or they stored them in optimum conditions which stopped the rusting process from beginning. Now, my first thought was that the staples had been replaced, but if you check the paper very carefully, you will see rust spots from the staples. And on checking the paper for these issues, I could not see any rust spots. My second thought was that someone had got to the comics in time and re-stapled them before the duff staples could affect the paper. The problem with that is have you ever tried to re-staple anything? At least one page out of ten will move and you will see the results in either a slightly enlarged staple hole or a brand-new staple hole. My third thought is that if first and second thought can be dismissed, then I have one hell of a responsibility in keeping these comics in such a great condition! Now going back to the comics, I found that I had now added a much higher grade of The Spider’s Web to my collection and one that featured Ian’s art that I had not seen before, but it took some time before I was 100% positive that it was one of Ian’s. This was because in the 1980’s, Fleetway did three things to confuse matters. The first thing that they did was to relaunch their picture library output so that they all started at issue 1 as even the most savvy of new fans would not be able to work back from there to figure out that some of these picture libraries had been going since the late 1950s (for exactness, War Picture Library was first published in September 1958, Air Ace Picture Library was first published in January 1960 which was followed by Battle Picture Library a year later in January 1961, which was mere months before D C Thomson’s Commando put in its’ first appearance and the last of these was the War At Sea Picture Library which made its’ appearance in February 1962). For any collector, this can be a right pain, but by classing these as Volume 1 and Volume 2, it makes it a little easier for when you need to figure out which issues you have and which are still on your wants list. The second thing that Fleetway did was always going to put a bump in the road for any collector as they started to reprint stories without given any indication that these stories were reprints so collectors would pick up what they thought was a new Alessandro Biffignandi cover and not realise that this was a reprint from 20 plus years before. There is a reason I am picking up on Alessandro Biffignandi and I will come back to it in a moment. But you can see that there is a significant difference in the colours of the original art and the reprint cover. But it was the third thing that Fleetway did that makes it harder for people to recognise who the original artists were and that was to appear to reprint from their back catalogue rather than directly from the art that I supposed that Fleetway had kept in a secure archive. 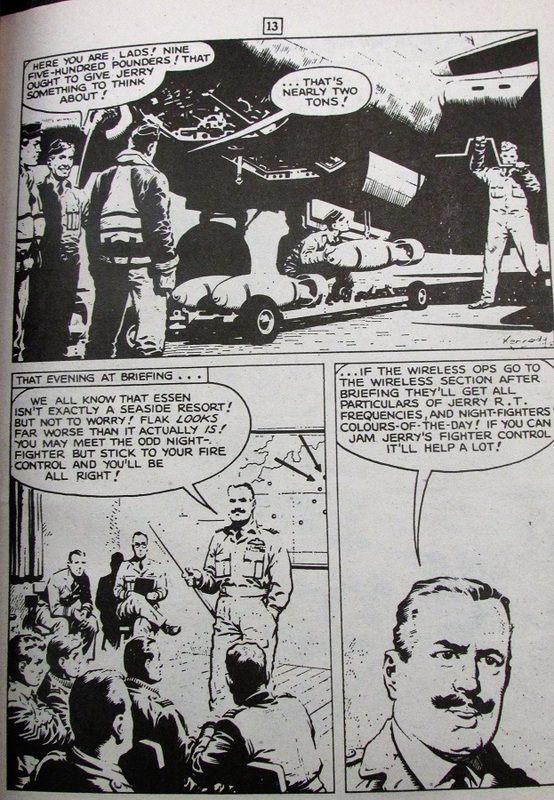 However, stories abound that when Fleetway and Amalgamated Press merged in the late 1960s, it appears that a large amount of art was either binned, destroyed, taken away by employees who enjoyed the art or those that saw the art as a second income by selling it on. In the pictures, you can see the significant loss of details between the original and the reprint. This is one of the many cases where we can be glad that fellow fans have done their best to preserve such gems. So, when I got the copy of Air Ace Picture Library issue 37 Fighter Fighter that was reprinted in 1985 (originally printed in 1961 as issue 39), I struggled to figure out who had drawn the art as it was so faded that it did not look like the art of a certain someone that I knew, but as I looked through the pages, I wavered thinking it was Kennedy’s work and then I thought it wasn’t. 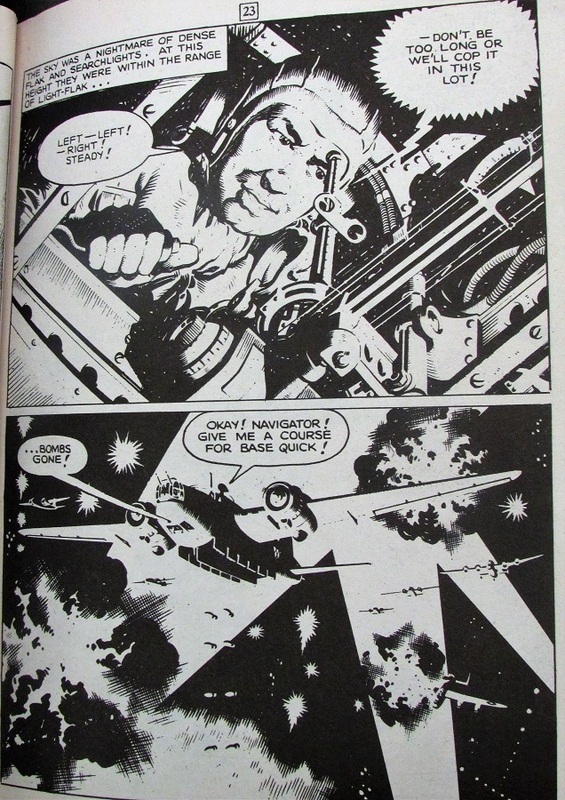 However, page 13 was lucky for me as I spotted a distinctive signature on the top frame and it confirmed that the internal art was Ian Kennedy’s. Now let’s go back to the start of this article and you will recall that I have been hunting for one panel of Ian’s art since buying the print. And if I had just turned to page 23 of this issue, I would have found it and confirmed the artist to boot! One final thank you goes to David Roach for his wonderful Aarrgghh!! It’s War book which is an invaluable piece of reference for anyone that is a fan of the Fleetway Picture Libraries. It just goes to show that no matter how much we learn about our hobby of comic collecting, there is always something else to find. Nice one, keep em coming. Nice post Colin. I always wondered what the ‘NA’ on those 1980s reprints stood for. I must admit that one has me puzzled too. But we will find out eventually!